If you live in North Kansas City, Missouri, then you never have to worry about your home remodeling, floor covering and tile needs. Kenny's Tile & Flooring, Inc. can take care of all of them. Our family-operated, Grandview-based business has been in existence since 1954. We've been providing top-notch tile and flooring services to North Kansas City residents for decades and decades. From installation to hardwood floor refinishing, if you're looking for a full-service company you can trust, call Kenny's Tile for your next North Kansas City home remodeling project. The services and products we provide are numerous. If you visit our company showroom, you'll be presented with a dazzling array of choices in stone and tile. If you like ceramic, porcelain, travertine or slate, just to name a few options, you'll enjoy choosing between everything we have to offer. If you're in the process of renovating your residence, you'll never have to look elsewhere for tile. If your North Kansas City home needs tile installation, we're the company for you. We also install hardwood flooring, granite countertops and even carpet. Whether you prefer Berber carpets, velvet carpets or anything in between, we'll be sure to surprise you with our many attractive and sturdy choices. At Kenny's Tile, we do it all. 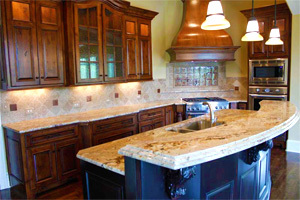 We handle all home remodeling projects in the North Kansas City area. If you need staircase installation, you can depend on us to do a top-notch job. If you need bathtub installation, we're experts in that realm, too. If you want a luxurious sauna or steam shower for your residence, we're your folks. We even refinish hardwood floors. We care about our customers at Kenny's Tile. This is why we always offer reasonable, affordable prices on North Kansas City home remodeling. When you decide to work with Kenny's Tile, you don't ever have to be intimidated by rates and expenses. If you want a free estimate, call us. You can also get an estimate via our website. Simply fill out our request form and specify which services or products you're interested in. For tile, carpet, flooring and granite countertop installation, our objective is pure customer satisfaction. Call us for the best prices and the best installation in North Kansas City.